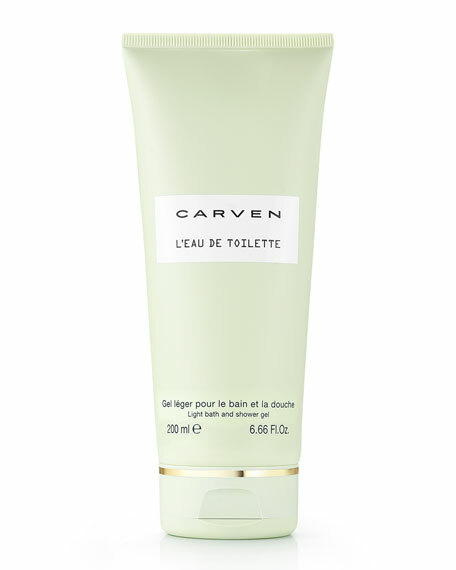 Enjoy the delicate and bright caress of Carven L'Eau de Toilette Bath and Shower Gel. The bath and shower gel creates a soft foam that cleanses the skin gently and transforms bath time into a pure moment of pleasure. Use the Bath and Shower Gel layered with Carven L'Eau de Toilette to intensify and prolong the sillage of the fragrance and offer an exceptional rendition of this fresh and luminous scent. 200 mL/ 6.66 fl. oz.